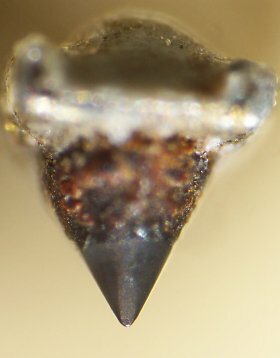 Advanced Stylus Shapes: Pics, discussion, patents. 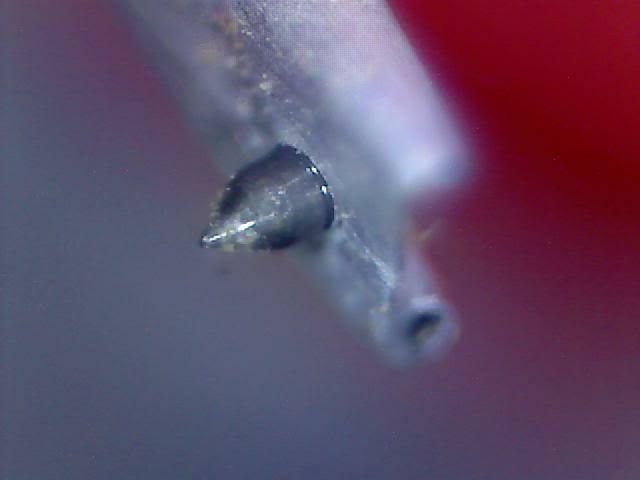 I'm opening this thread to contribute showing and discussing the different stylus shapes and profiles that exist. I will be using images stolen/copied/borrowed from this forum and from the internet, so i apologize in advance if someone feels he wasn't given the due credit. The idea is to contribute as many pictures and information in the different stylus profiles. First, many profiles at the same time, as a starting point. Not all profiles are in those pics! 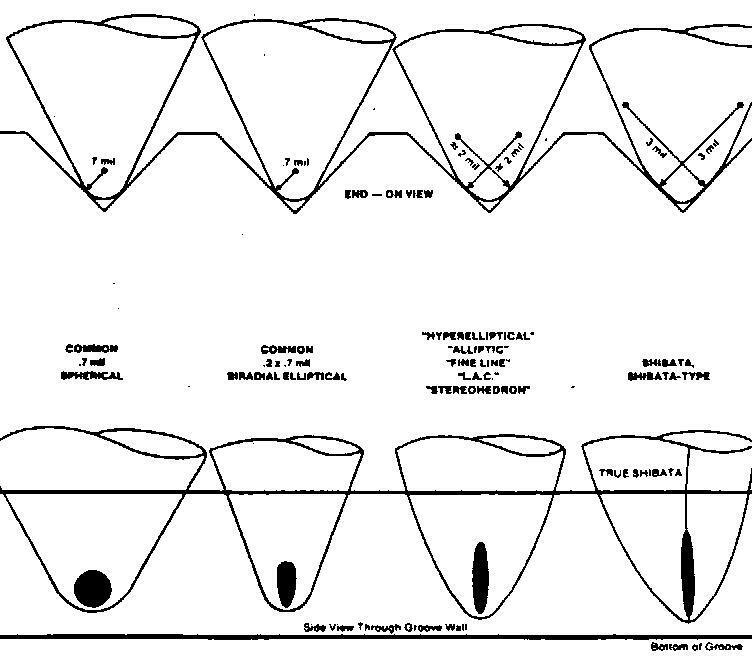 Let's start with the elliptical shape, the most basic of the non-spherical shapes. Patent is by Grado. More examples of elliptical later. Now on the line contact shapes. The idea of the line contacts is... to have a bigger contact on the groove wall side while having a small front-to-back contact. That is, a "line". Maybe i am not good at explaining it but the pictures will speak for themselves. 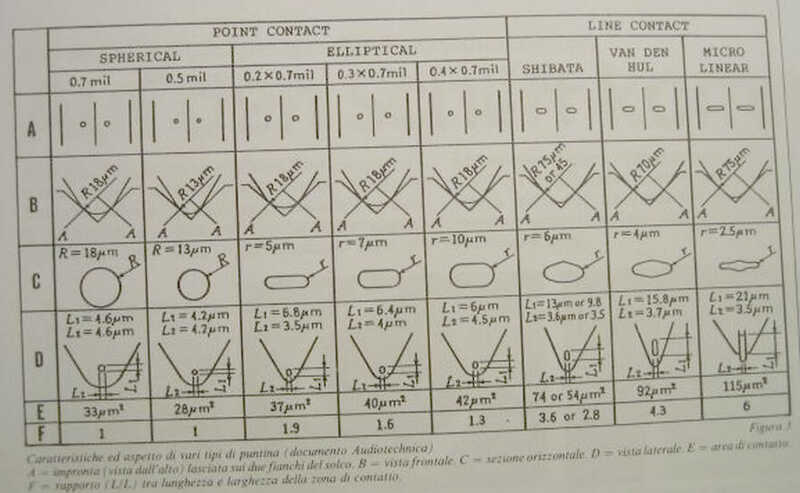 One of the first line contact shapes was the Shibata, invented by Norio Shibata of JVC. The goal was to track the high frequency (35KHz+) content of the CD-4 quadraphonic records without wearing the groove. The "R" radius is bigger than on a spherical (Shibata=75uM), which means the groove will be contacted more parallel to the diamond surface. Actually the right way to express it will be "less round" instead of "more parallel"! The two back cuts are evident. They are also evident on the JICO picture i posted before. Now another of the first line contact shapes. This one is labeled by this website (vinylengine) to be the Pickering Stereohedron (or Quadrahedron?) shape. 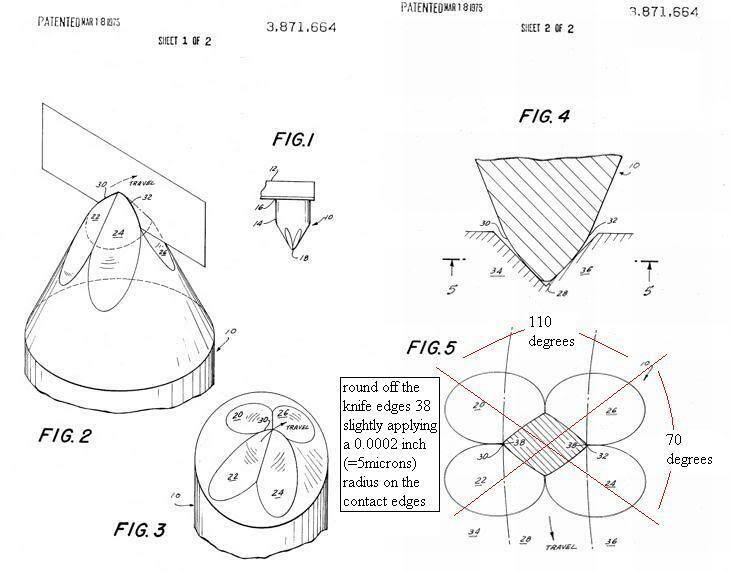 Inventor: Huges, Diamagnetics Inc. Diamagnetics seems to be affiliated with Stanton/Pickering. A later (1978 shape), the Ogura, also sold as "Vital Polyhedron". This one is more similar to what has been labeled as "line contact" by Audio Technica (see pic above) or "fine line" as Ortofon. Shot of the Ortofon OM30 stylus -- how beautiful! Now, the question that i can't really answer. 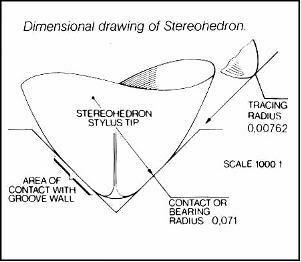 What patent matches the Hyperelliptical and Stanton Stereohedrons?? They look similar and they can be a variation on the Ogura, or the Hughes... or another shape? I can't find another patent that might match them. Ogura was sold as "Polyhedron", which sounds like... "Stereohedron"! Pictures of them (SH and HE) to follow on next post! Now the Shure Hyperelliptical looks pretty similar!! Let's move on to later shapes. Here is the VDH, invented by the dutch A.J van den Hul, around 1978. Now on more advanced shapes. Here is the highly regarded MicroRidge/MicroLine shape, patent by Namiki, 1983. 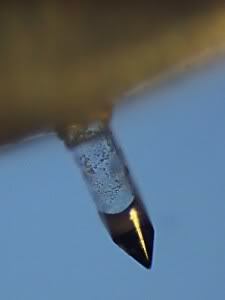 The idea came from the stylus used for reading the capacitance electronic video discs such as RCA's SelectaVision. There are variations on this design. The idea is to really contact the groove wall on a line. 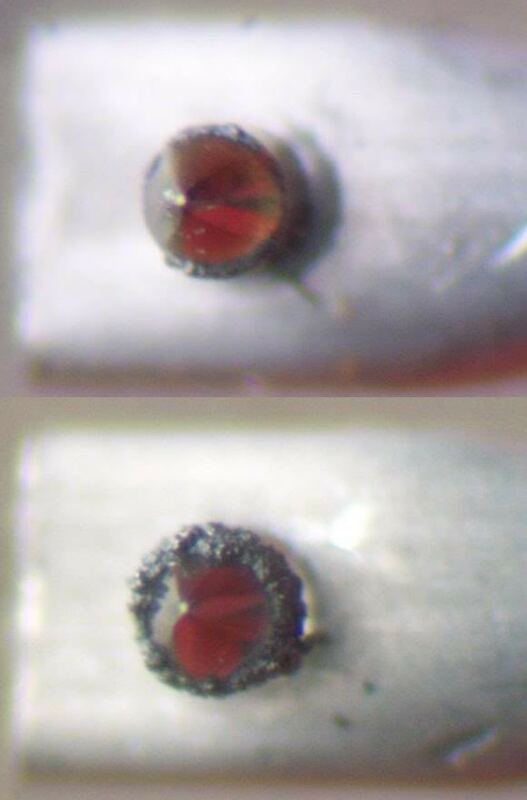 The other interesting thing is that these styli are laser-cut. Variations on this design are the Audio Technica MicroLine, Shure MicroRidge, Dynavector, and JICO SAS. JICO SAS specs. Very interesting. Now the last of the patented shapes, as far as i can find: The Fritz Gyger (1987), used on some Ortofon cartridges like the OM40. This is a weird kind of stylus... Like a cubist micro line. 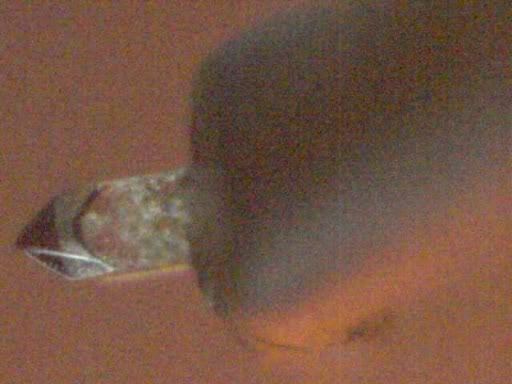 The purpose of the FG stylus is to more closely match the cutting stylus. Now, on to the comparisons! One of the benefits of the advanced shapes is to increase the contact radius. In theory the worst shape (the spherical) contacts the vinyl wall at an infinitesimal dot. So the contact area is (in theory), ZERO. But, of course, vinyl deformates, so a practical contact area will be established, and it will have to be estimated for the spherical. Note that "Line contact" here is actually the Shibata. Note the "r" radius (the side radius. 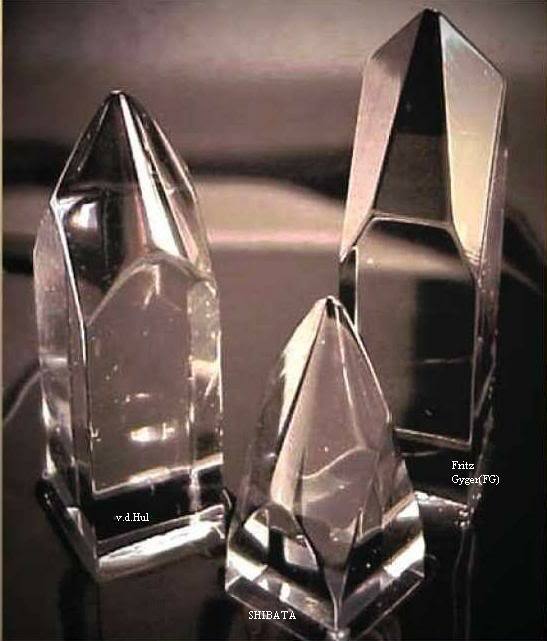 The smaller the better will the higher frequencies read. Here for example you can see why a line contact shape is beneficial: The best high frequency readout will be obtained with a 0.2mil side radius (or smaller!). 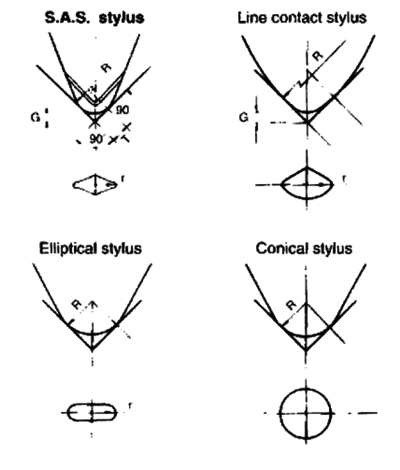 The .2x.7mil elliptical delivers it, but the contact surface is smaller than the standard elliptical or conical. The advanced shapes can give you the same (or smaller) side radius (better ability to read high frequencies) with a bigger contact surface (less wear). And that's why they are good. 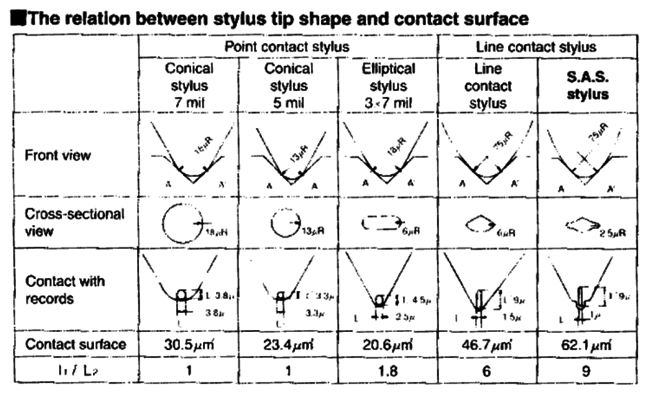 Note that the last row (L1/L2 or "F") tells you how "tall" is the side contact, the taller the better since it means big contact area but with small side radius. Also note that the van den Hul is included on the comparison, and according to Audio Technica, the MicroLine is better. Moreover, if you go to JICO online store, you won't find the SAS stylus being sold for the current Audio Technica cartridges! I bet Namiki is making both AT ML and JICO SAS styli. Another thing to point out: AT's estimate more contact area for all shapes. That means they are using a different estimation of vinyl deformation. Look at the major radius ("R"). 23uM for the Hyperelliptical versus 75uM for the Shibata. Or, 0.7mil versus 3.0mil!! So it seems the manufacturers who sell the HE, are using a smaller major radius ("R"), thus the Shibata has more contact surface than the HE they sell. "Stereohedron 2x" seems to have 70uM of "R" radius according to PickeringUK. Stanton 681EEE quotes the same. Also note the Ortofon 2M's Shibata has 50uM R radius, so it's the smaller version of the Shibata (patent specifies two versions). Spherical, Elliptical, Shibata & "Hughes", Ogura, van den Hul, Micro Ridge, Fritz Gyger. 2. "Hughes" patent is simply a variation on the Shibata: Two more cuts at the front, and voila. 3. Expert Stylus' Paratrace is practically a VDH. 4. Jico SAS, MicroLine, and Dynavector seem to be exactly the same shape. 5. There are reasons to believe Namiki manufactures the ML shape for Jico and for Audio Technica. 6. 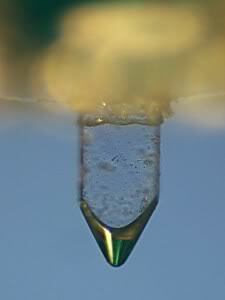 Vinyl deformation is taken into account when calculating contact surfaces. 7. Is the HE the same as the Stereohedron? I don't know. Dimensions seem to be different. 8. What patent matches the HE? What patent matches the Stereohedron? Ogura? Maybe. 9. Is the Ortofon Fine Line an Ogura? Maybe. 10. 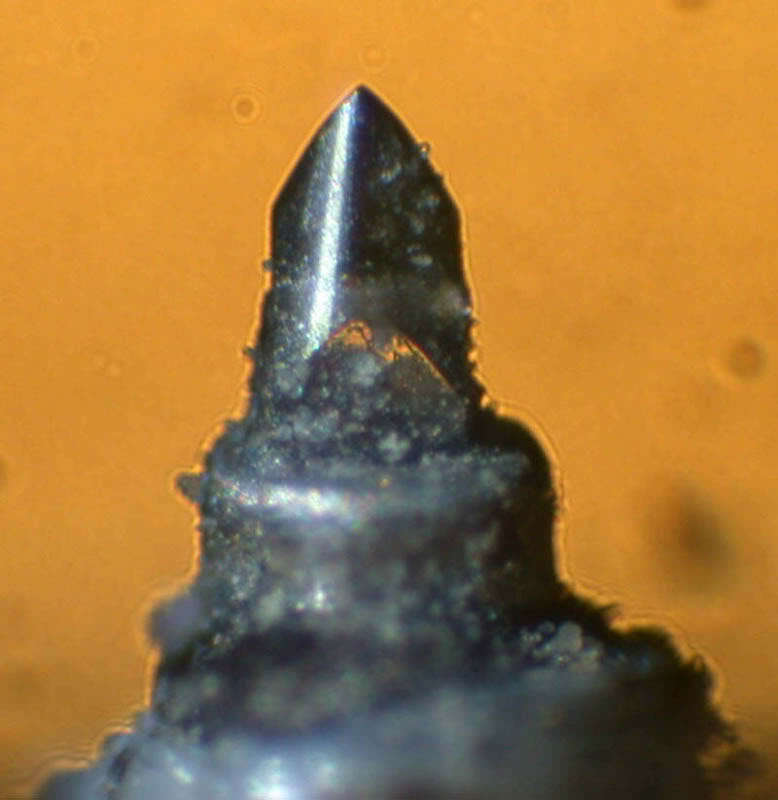 Ortofon Fine Line shape is identical to Audio Technica's "Line contact". 70uM for the Fritz Gyger 70 [FG70] according to Ortofon. FG90 also exists. 75uM for SAS and MicroLine. 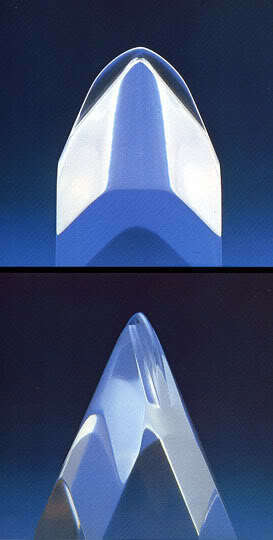 * The shibata patent specifies two versions of the tip: <50uM and <75uM. For VDH there are two versions too, VDH I and VDH II. P.S.- did I miss the Fritz Geyger designs? No, i covered them too, but i don't have actual styli shots. 12. So for all the pre-MicroRidge Fine Line shapes, the Shibata is the oldest, but it's the one that comes with the biggest "R" radius, compared to the HE or the AT Line Contact/Ortofon Fine Line. 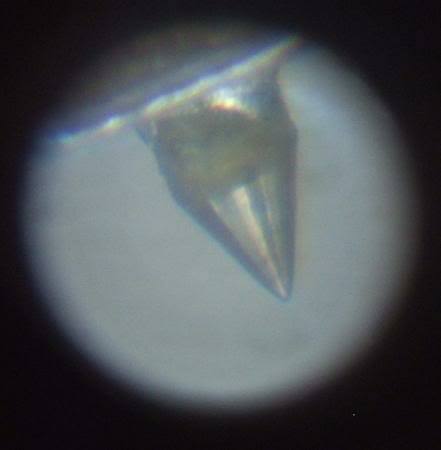 The Stereohedron has a similar R radius, we don't know its stylus profile patent. It might be the "Hughes" one, which is almost the same as the Shibata. I need more pics of it. Also you can see that the Shibata seems to be very easy to manufacture! !